Wendy Werneth is an intrepid world traveler, vegan foodie and animal lover. 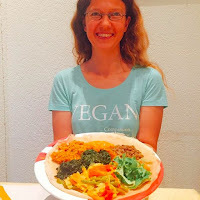 She is the author of the book Veggie Planet and the creator of the award-winning vegan travel blog The Nomadic Vegan, where she uncovers vegan treasures across the globe so that you can be vegan anywhere and spread compassion everywhere. and Where in the world did you discover your best meal/vegan find? Today, Wendy is back on our blog answering more questions about her vegan travel lifestyle. We are excited to have the opportunity to interview her again and get her perspective on vegan travel as she is quite the expert and role model for all those aspiring vegan world travellers out there. She is a vegan travel trailblazer and has gone to many different countries all over the world eating all kinds of vegan food on the way. Lucky for us all, she has a blog and can share all her advice to help us on our own adventures. Without further ado, here is our interview with Wendy Werneth, The Nomadic Vegan. Travel came first. Travel has been a big passion of mine ever since childhood, and I’ve been living out my travel dreams for all of my adult life. Back in 1999 I left the States to go work abroad in Paris, and I’ve been living, working, studying and traveling in different countries around the globe ever since. So far, I’ve visited 109 countries and counting! Veganism came much later for me, in 2014. At first, I didn’t know if I could ever be fully vegan, because I was afraid that it would ruin travel. But once I gave it a try, I discovered that being vegan actually made travel even better! Hmm, good question. I’m curious to return to Thailand as a vegan and check out the scene in Chiang Mai. But actually, I’m really happy living in Mediterranean Europe (my current home base is Lisbon, Portugal). Even though the Med doesn’t have the biggest vegan scene, many countries in the region have traditional cuisines that are naturally very plant-based. I love uncovering local specialities that happen to be vegan. I love going to vegan restaurants, because they provide a safe space where I know I’m not going to see any animals being eaten, which I do find upsetting. At the same time, I think it’s important to show mainstream restaurants that there’s a demand for vegan food, so I tend to frequent both types of eateries. HappyCow is the first resource I turn to when researching food for an upcoming trip. It’s the most extensive worldwide directory of veg-friendly restaurants available. But I also just use Google to research the local cuisine. I try to seek out as many vegan local specialities as I can. No, that’s not a factor in my decision to travel somewhere. I’m confident that I will find vegan food anywhere I go, so I don’t let my veganism restrict my travels. It’s always fun to travel to vegan-friendly destinations, but, as I said, I don’t limit myself to those destinations. I always do research beforehand, so I have a pretty good idea of how vegan-friendly a place is before I arrive. But it often turns out that there are more options than I had anticipated! Italy and Greece both have dozens of plant-based dishes that are part of their traditional cuisine. Lisbon, where I live now, has lots of great vegan and vegetarian restaurants, with more opening all the time. And Madrid and Barcelona also have a huge plethora of vegan options. Moving beyond Europe, Cape Town in South Africa really surprised me with its huge vegan scene! And of course, Berlin in Germany, Chiang Mai in Thailand and Bali in Indonesia are all known to be vegan havens. I don’t always eat as healthfully on the road as I do when I’m at home. I do always keep some healthy snacks on hand, though, such as nuts and dried fruit. I also love the Primal Strips vegan jerky. I mostly eat out in restaurants, because I love to discover the local cuisine and also see what veg restaurants are offering in different parts of the world. Preparing your own meals can come in handy sometimes, though, and it’s definitely a great way to save money while traveling. I generally prefer apartment-style accommodation, but I will sometimes go for a hotel room if I’m arriving late or only staying for one or two nights, since hotels can be more convenient for checking in and out, leaving bags at reception, etc. If I’m traveling on my own, then I’ll get a bed in a hostel or try to find a host on Couchsurfing. If my husband and I are traveling together, then we prefer to get a private room in a hotel or an AirBnB. We still tend to go for the cheapest option available, though. My husband Nick and I travel really well together, and I love sharing my adventures with him. I wouldn’t want to travel with anyone else, though! Nick and I both want the same things out of travel, and we get frustrated if we’re traveling with other people who go at a slower pace or just want to hang out in cafés all day rather than really explore a place. There are also lots of benefits to solo travel, and even group travel could be a good option for some people. I typically travel independently, but this year I’m going to be leading a couple of vegan tours to Portugal and Italy and am really excited about it! These are two of my favorite countries in the world, and I can’t wait to help other people uncover some of their hidden secrets. Oh yes, definitely! Every week I update my blog, The Nomadic Vegan, with restaurant recommendations and vegan discoveries I’ve made while traveling the world. I also post photos and stories on Instagram, which is the best way to follow my adventures in real time. It’s all about attitude and mindset. If you go into the experience of vegan travel expecting to find scarcity and lack, that’s exactly what you will find. On the other hand, if you look for abundance you will find it everywhere! That might sound a bit woo woo, but it’s really true. For more practical tips about the ins and outs of finding vegan food while on the road, you can download my free ebook, 9 Steps for Easy Vegan Travel. Thank you, Wendy, for participating in our vegan travel interview! For those of you who are just learning about vegan travel and veganism, check out Wendy's free ebook and get travelling! If you are a vegan traveller and would like to be included in our next mini interviews or star in a post of your own on your vegan travel lifestyle please email us at wanderlustvegans@gmail.com for more details. Awesome interview...Thanks Wendy for sharing, I'll be sure to check out your blog. Love this interview. I'd like to thank Wendy for sharing her experience and thoughts with us. I'm so glad you enjoyed the interview, Stella!